5th German Champion: Danuta Kilian-Bischof! The fifth German Championship took place during the Domino weekend of FIDO Germany in Sandstedt. 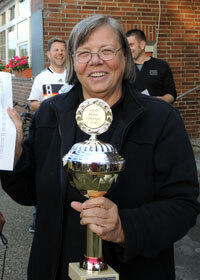 The participants – already weakened by the Mary Theresa Cup tournament – showed respect to the experienced guest from Cologne and let her win the title. 13 players formed three teams playing double-eighteen in two rounds.